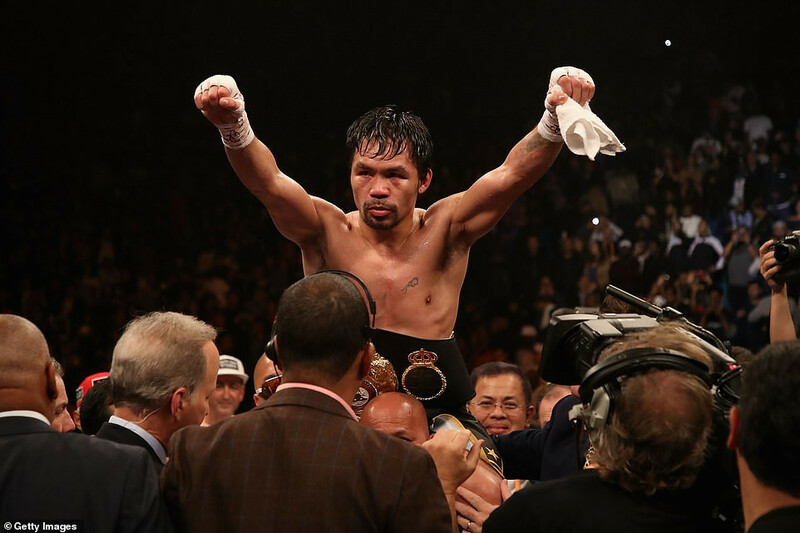 Philippino boxer, Manny Pacquiao has just defeated his American opponent, Adrien Broner to retain his WBA ‘regular’ welterweight title in his 70th professional bout. The 40-year-old boxer defeated Adrien, 29 with a dominating unanimous decision in front of a sellout crowd of 13,025 at the MGM Grand Garden Arena in Las Vegas. The judges scored it 117-111, 116-112, 116-12 all in favour of Pacquaio. After the win, Pacquaio said: ‘I feel so happy because I did my best in the fight and in training. Our strategy we user a lot and we did a lot in the training camp for this victory. ‘I am so happy because God gave me good health and at the age of 40 I can still give my best. I want to be aggressive more but my coach told me I just wait to counter him. ‘I don’t believe my career is over. I prove it. Manny Pacquaio’s journey still continues. I want to push more but my trainer said just take time and wait for him so I could counter.